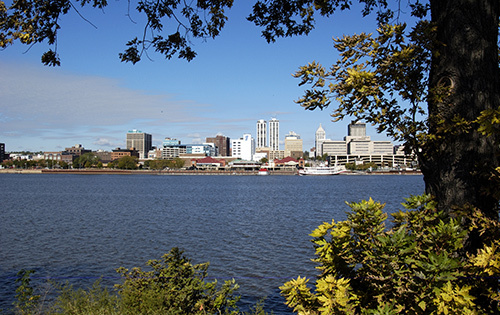 Settled in 1680 and incorporated in 1845, the City of Peoria is the county seat of Peoria County, Illinois. Its Eastern border is bound by the Illinois river and happens to be the largest city along the river. Peoria’s weather ranges from cold, snowy winters, to hot, humid summers. This is known as a humid continental climate. With its 9,000 acres, the award winning Peoria Park District is home to parks, trails, bikeways, camps and golf courses. While Peoria does not heavily regulate trees on private property, it does protect and care for those in the public right of way, as well as those in Historic Districts. Following is an excerpt from http://www.treeremovalpermit.com/illinois/peoria-ordinance-permit-application-land-development/ covering the Peoria, IL ordinance and tree removal permit regulations. Public Tree Blocking Road or Impeding Traffic – When a storm-damaged limb or fallen tree is encountered in the roadway or impeding traffic, the City’s Public Works Department – Forestry Division should be contacted at (309) 494-8850. In the event of physical damage or an after hours occurrence, call 911 for Emergency Services. Public Tree Blocking Sidewalk or Driveway – If a fallen city tree or large limb is blocking a sidewalk or driveway, the City’s Public Works Department – Forestry Division should be contacted at (309) 494-8850. Public Tree Fallen on Private Property – If a tree or branch from city property falls onto your yard or private property, the City’s Public Works Department – Forestry Division should be contacted at (309) 494-8850 and will remove the entire tree. Power Line or Utility Interfering Tree – Ameren will disconnect the service drop (by scheduled appointment via 1-800-755-5000) for private property locations to allow residents or their agents to trim back or remove interfering trees. Residents should report public or city trees that pose a hazard to utilities and power lines to Ameren Illinois. For further utility-related tree damage or interference, visit Ameren’s tree trimming and removal forestry division. Public Tree Diseased, Dead or Dying – If there appears to be a dead or dying tree on city property that needs to be checked for removal, the City’s Public Works Department – Forestry Division should be contacted at (309) 494-8850. Private Tree Fallen on Public Property – If a tree from your yard or private property falls onto public property, the City’s Public Works Department – Forestry Division should be contacted at (309) 494-8850. The City is only responsible for removing the portion of the tree in the public right of way. The remainder of the tree on private property will be the property owner’s responsibility. Visit the City of Peoria Public Works Forestry Division for more information or to request tree removal. The City of Peoria Public Works and Community Development Department can provide further clarification on the tree ordinance, permit, and land development plan requirements. Use the below information to contact the respective city department representative.